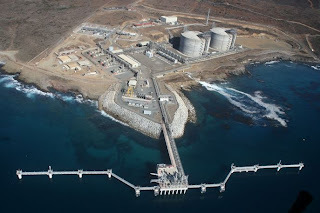 ORIGINALLY PUBLISHED MARCH 1, 2011 AT 7:05 P.M., UPDATED MARCH 1, 2011 AT 7:18 P.M.
More than two weeks after Ensenada’s mayor attempted to shut down Sempra’s liquefied natural gas terminal outside Ensenada, supporters in Mexico’s federal legislature on Tuesday called for a review of the facility's permits. The non-binding measure, known as a punto de acuerdo, also called for the removal of Mexican military forces that have been safeguarding the installation since Feb. 11. The resolution was proposed by José Narro Céspedes, a legislator from the state of Zacatecas and member of Mexico’s leftist Party of the Democratic Revolution, the PRD. It passed with 259 votes in favor, 95 against and five abstentions. The measure gave support to the move earlier this month by Ensenada’s mayor, Enrique Pelayo, to shut down Sempra’s Costa Azul LNG terminal, “temporarily and partially” by sending members of the municipal police to the facility. Pelayo was not successful in his attempt, and the action drew harsh criticism from Mexican federal officials. Pelayo, who took office on Dec. 1, has alleged that the permits were not properly issued, an assertion that state and federal authorities have denied. Mayor Pelayo is a member of Mexico’s once-ruling Institutional Revolutionary Party, the PRI, while Baja California’s state government is controlled by Mexico’s ruling National Action Party, the PAN. Tuesday’s congressional vote was largely divided along party lines, said Francisco Javier Orduño, a representative from Baja California. He voted against the measure, along with nine other legislators from Baja California who are members of the PAN.